With no forums, they're heading back to Steam for help. The Epic Games Store doesn’t have forums. When Epic announced the platform, it framed this as a positive thing. No forums, it said, would stop toxicity from flourishing, and with Discord, Twitter and developers’ own forums, there are other ways to get in touch. 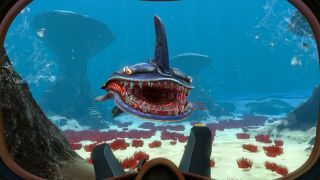 One of those alternatives is Epic’s competitor, Steam, and some players have turned to its forums to get support for the Epic Games Store version of Subnautica. Reddit user Revisor007 was on the Subnautica Steam forum when they noticed several posts asking for support for the Epic Games Store version of the game. "Can’t run Epic Games version without Epic Launcher anymore," one reads. "Where is the save location on Epic Games?" another asks. In one of them, a developer actually chimes in and offers a solution. It’s hardly an epidemic, and looking at other Steam forums, they’ve yet to devolve into support forums for Epic users. The store gets mentioned here and there, but not in the context of asking for assistance. I also saw topics about console versions and Origin versions, so really this is just a matter of Steam still being this huge, ubiquitous thing that a lot of people use because they’re used to it. Still, support on the Epic Games Store probably needs a rethink. Looking at store pages reveals no information about how to deal with issues with the game, beyond some social media links. If a game has bug reporting and a ticket system, that’s not clear either. It’s not just about offering support, then, but making it clear how you get it, too, and pointing in the direction of Twitter doesn’t cut it. As Tom pointed out, the Epic Games Store is slick, but it has some key flaws, and a lot of those flaws are how it chooses to, or in most cases chooses not to, show important information.